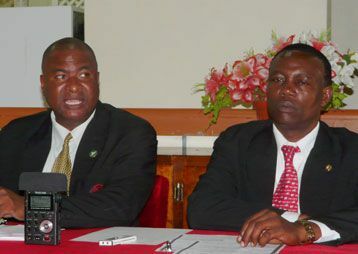 Oswald Robinson, president of the union, said yesterday at a press briefing that the unionâs executive had struggled to secure a meeting, although the current accord was inked in 2005. He said it is important that a new agreement be signed to include some of the changes made internationally. âThere are standards set internationally that we need to upgrade â¦ We are living in an environment where things are changing,â Robinson said. There are also grievances that need to be addressed Robinson said, mentioning induction courses. He explained that article 23.1 of the existing agreement states that any induction courses, held for teachers must be in conjunction with the union. Robinson, however, said that for the last two years there have been induction courses but the union has been left out. âThis is unacceptable,â he said. He further said article 25.1 of the agreement deals with transfers. But there were teachers still being transferred to areas that are unreasonable in light of where they reside. Some affected teachers have written to the Ministry of Education, the union president said, adding that the union has also attempted to resolve such issues. So, too, was the issue of casual mileage, covered under article 29.7 of the collective agreement. Robinson said the casual mileage was still being calculated in terms of colonial times. âIt is old and needs to be revisited,â he said. The press briefing also highlighted promotions. Robinson referred to article 26.2 of the agreement, which states that once a teacher has pursued a course of study approved by the Ministry, then the education officials have a responsibility to report this to the Service Commissions Department within a reasonable time â within a year of the completion date of the course, Robinson said. âWe have teachers today certified and it is going on five years and they have not been appointed,â he said, adding that the process was taking too long. The union president said the ministry was consistently violating the grievance procedure, under article 30.2. It says grievances must first be resolved between the principal of the institution and the steward, or unionâs representative at that institution. If the matter cannot be resolved at this stage, the union and the ministry must resolve it, Robinson explained. âBut the problem is when matters come out of school, the Ministry of Education does not want the union to get involved,â the president said. Robinson said that the industrial relations officer had been intimidated several times and if the union becomes involved, then the Ministry will indicate that it will not be getting involved. But the members of the union had to defend the collective agreement. âThat is the document that guides how we operate,â the teachersâ union president said. He said that the executive has had to walk in on the ministry and demand a meeting. âThey say that they are busy people; we are busy people, too,â he told the media.